The Denver Broncos journey for a Super Bowl begins with the same team that ended their quest last season as they face the Baltimore Ravens for the NFL season kickoff (Thursday, 8.30pm ET). Last year, Peyton Manning (pictured) and the Denver Broncos (13-3) saw their Super Bowl aspirations end at the hands of Joe Flacco and the Baltimore Ravens (10-6) in a heartbreaking 38-35 playoff game. Baltimore would go on to win the Super Bowl but for Denver the loss has left them hungrier and more determined to get back to the postseason in 2013. Last season saw the Broncos win 13 games in large part because of the resurgence of the one and only Peyton Manning. In the offseason, Denver signed Manning after the only team he previously played for, the Indianapolis Colts, made the decision not to resign him following a host of neck surgeries. In many ways Denver took a gamble on Manning, who was 50-50 on whether he would ever play another NFL game. 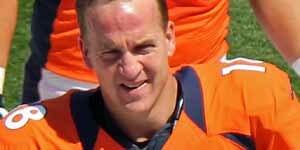 Luckily for Denver however, Manning has played at least 16 and it is looking like a gamble that could hugely pay off. Aided by the best tandem of wide receivers in the game in Eric Decker and Demaryius Thomas, the Broncos finished fifth in the league in passing yards with an average of 283.4 per game. Those stats look to get even better this year as the Broncos signed Tom Brady’s favorite target, Wes Welker. A dominant slant receiver, Welker’s addition will allow Manning to really move the ball around the field. He may be the missing piece between the Broncos and a championship. But offensively was only one side of the ball for the dominant Broncos. Denver’s defense was also top notch, finishing third in both opponents passing and rushing yards. And while this squad looks to once again be solid, it will have to survive a six-game suspension to Von Miller, who finished last season as third in the league with 18.5 sacks. In many ways, the Baltimore Ravens were an average team that got hot at the right time and managed to win the Super Bowl. Led in the air by Joe Flacco and on the ground in Ray Rice, the Ravens won 10 regular season games en route to reaching and subsequently winning the championship game. But again, even in their best category, rushing, the Ravens ranked just 11th in the league. Also, the Baltimore defense is far from the dominant squad it has been in the past, despite the fact that they played well in the postseason. Overall, Baltimore ranked just 17th in opponents passing yards and 20th in opponents rushing yards. This was before the defense lost Ray Lewis to retirement and Ed Reed to the Houston Texans. However, Baltimore revamped its defense in the offseason and it looks to be better, faster and stronger as a result of the young additions. The team picked up Elvis Dumeril, who last year had 11 sacks for Denver and added Matt Elam, a talented safety out of Florida State University, in the 2012 draft. Offensively, Flacco lost a lot of weapons as notably, Anquan Boldin left for the San Francisco 49ers and tight end Ed Dickson struggled through injury. The team signed Dennis Pitta to fill that role but he quickly went down in the preseason and is slated to miss the entire year. For that reason, the young offense is going to depend on unproven yet raw talented stars in Jacoby Jones and Torrey Smith. It could be a formula for disaster but the Ravens do still have Rice and the young Bernard Pierce, both of whom should play a nice complimentary role in the running game. While on paper Denver already has the better team, a fact that is evident in the spread favoring them by a whopping 9.5 points, the Broncos also have another notable advantage. For starters, the Broncos get to open their season against the defending Super Bowl champs at home. Normally the champion gets this honor but because of a conflict with the Baltimore Orioles, the first game of the season will be played in Denver. And because of this, the Broncos do have a decided advantage. But they also have another advantage, that being the fact that there is the matter of exacting revenge. Denver is not that far removed from receiving its postseason ouster at the hands of the Ravens. Of course, with this memory fresh, don’t expect anything less than for the Broncos to come out early and often. This is a statement game for them in more ways than one and with high expectations of reaching the AFC Championship and Super Bowl, starting the year off beating the Ravens will only help that confidence factor. Everybody knows of Rice’s infamous run last season that was intended as a mere check down fourth down play that Rice turned into a 20-something yard first down gain. He ran it straight up the middle and the sing songy rhyme ensued. But against the Broncos and their third best defense, can Rice still put up enough numbers on the ground to keep this game competitive? Rice has the advantage of being a pass catching back which makes him a double threat. And as a double threat, he is just that much harder to stop. In 2012, Rice rushed for 1,143 yards and nine touchdowns, actually making it a down year for the 26-year-old. He will have a tough task ahead of him against Denver but there is one major difference. As mentioned above, the Broncos are without Dumervil for the season and Miller for the first six games. Both of those guys helped make Denver the impenetrable defensive front it was and both are missing. Expect the veteran Rice to take full advantage of that. The sportsbooks really seem to support Denver in this one as a 7point deficit on the spread is pretty lofty. The over/under is set around 48. Ultimately, Denver is probably going to win this game but not in a runaway like the sportsbooks predict. After all, Rice alone will be a huge factor in keeping the game close until the end. So that said, take the Baltimore Ravens with their +7.5 points starting advantage at odds of -115 with WagerWeb Sportsbook. It is +7pts for the same odds with Bovada and BetOnline. Also, expect the game to exceed the over as both offenses should be going at full speed. So take over 48 @ -115 with Bovada. It is over 48.5pts but at slightly better odds of -105 with BetOnline (or -110 with WagerWeb). RESULT UPDATE: Broncos won 49-27.